It has been extremely interesting to see so many new brands launch that are certified organic lately, I don’t think for a second that the organic beauty movement is going to slow down, in fact I think it will go from strength to strength. KINN is one of those brands that are instantly appealing with it’s minimalist aesthetic and clean lines, in a way that also reflects the purity of the ingredients inside. Launching just this spring, KINN is a brand that has captured my attention. KINN was founded by a Mother daughter duo, Marie Lavabre and Sophie Lavabre-Barrow. Quite uniquely I think, the brand describes itself as a “lifestyle brand with a range of plant based products for your body and your home”. There aren’t that many natural cleaning ranges available, so this is something that piqued my interest. I will definitely be exploring the cleaning range at some point, after all any brand that can make cleaning appealing is a winner in my book, but for now I want to talk to you about the gorgeous body care range. The brand has launched with four bodycare products, all with the same signature scent running through them. The signature scent is a blend of Sweet Orange, lavender, chamomile and Ylang Ylang, It’s not really a classically relaxing or invigorating scent but falls somewhere in between, it’s really rather lovely and works just as well with your morning shower as it does your evening relaxing bath. All the products have the new Soil Association Cosmos organic stamp of approval and are also cruelty free and made in the UK. Body Wash – (£14 for 200 ml) The body wash creates a good amount of soft lather thanks to the inclusion of Sodium coco sulphate, not to be confused with SLS or Sodium Lauryl sulphate although the two do have some similarities. Sodium coco sulphate is derived from coconut oil, and tends to be less drying and less processed than SLS which I find horribly drying to the point it makes my hands crack if I use it regularly. The KINN wash feels cleansing without being stripping and scent lingers on the skin which is lovely. A nice all round wash that is enjoyable to use. Body Lotion – (£18 for 200 ml) Perhaps my favourite product in the range, with cocoa butter, shea butter and olive oil. This lotion is great for dry skin like mine, it also is very practical to apply thanks to the pump packaging. I love the lovely scent that is left behind, it lingers but isn’t overpowering. With a silky feel and really fast to absorb, it’s great for days when you don’t have much time. This is one I would likely repurchase, KINN’s fabulous aesthetic looks great on the dressing table too. Body oil – (£22 for 100 ml) The body lotion is a great moisturising body product by itself, but you can also combine with the body oil or if you prefer use this instead. I like to add a few drops of the body oil to the body lotion, to add even more nourishment or use it alone after a shower. The body oil sinks in easily and feels silky on the skin, it has avocado oil, jojoba and sweet almond oil. It’s competitively priced when you compare it to other Soil Association certified body oils and the packaging is very practical to use. Bath oil – (£28 for 100 ml) Following on from the body oil, you also have a bath oil, which is especially nice if you like to use the same scent throughout your routine. The body and bath oil have very similar ingredients, but I think the bath oil has a higher concentration of essential oils to ensure it scents the whole bath. You don’t need a lot for a lovely relaxing soak. 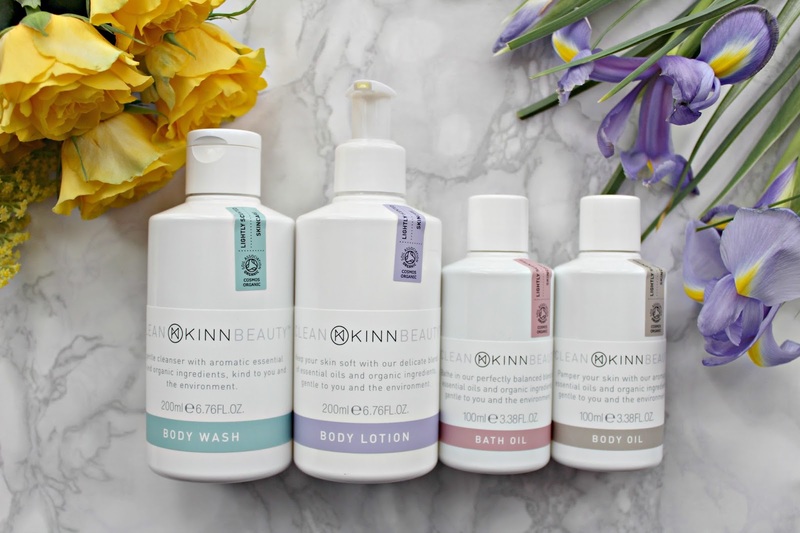 As you can probably guess I have really enjoyed KINN products, the body lotion is a standout and I will update you when I have had a chance to try the cleaning range. If you are looking for certified organic products, I tend to recommend Soil Association brands, as every product will have a high percentage of organic ingredients and other ingredients all have to come from an approved list. KINN’s body care range are all certified organic by the Soil Association KINN’s simple and practical packaging is great for travel and for use in the bathroom. What do you think of this new launch? Let me know in the comments below.